When he retired from his engineering job in the late 1980s, Ralph Miller already knew he wanted to spend his retirement weaving. An avid weaver, he had previously built an immaculate “loom room” and had woven all the beautiful draperies throughout his house. Word soon got around the Sandhills craft community, and gradually other weavers in the Pinehurst, NC, area gravitated towards him. They started to meet regularly in his home and became known as The Sandhills Handweavers and finally The Sandhills Handweavers Guild. What was true then is just as true today. So, whatever your age or skill level, if there is a fiber artist buried deep inside you somewhere, join us and give expression to your latent creativity. Our Guild’s mission is three-fold: To preserve our fiber heritage, to foster creativity in a supportive atmosphere and, finally, to encourage education both among ourselves and the general public. It’s different! 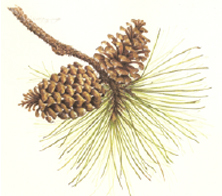 We don’t have a fiber-related picture in our header, However, the long-leaf pine is emblematic of North Carolina’s Sandhills region. It is a beautiful tree, of which there are very few stands left. Consequently, we decided to use it as our logo. Here’s to the land of the long-leaf pine. Where the weak grow strong, and the strong grow great. Here’s to “Down Home”…. The Old North State. Dec. 2 Bryant House Holiday Open House 1:00 p.m. – 4:00 p.m.
Dec. 7, 8 & 9 Shaw House Hliday Open House 1:00 p.m. – 4:00 p.m.